Do you have a little Jedi in your family that’s excited for Star Wars Day on May 4th? 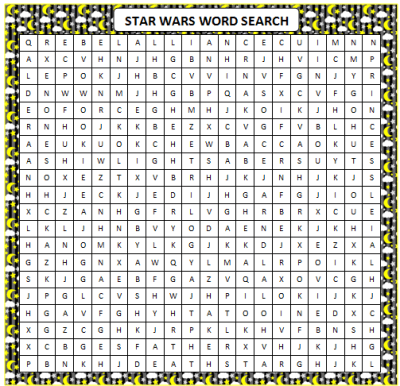 Then you’ll like this free printable Star Wars Word Search. It’s a great road trip activity too! Check out the words in the searchable puzzle below. Do you think I missed any of the main words used to describe the series? Which is your favorite character or movie? To go along with this free printable word search, you could plan fun activities like a lightsaber battle, a Jedi training camp (obstacle course) or a movie marathon. For fun Star Wars inspired food, check out this collection of Star Wars party food on the Kitchen Fun With My 3 Sons blog. There are plenty of ideas here so you’re sure to find something that your kids will love. They are so easy to make that they’ll love helping you as well! What other words can you think of for a Star Wars Word Search? I don’t know much about Star Wars (sorry to all the fans out there!) so I had to do some research. We have loads of free printable games for family fun. Visit our Free Printables Games page for a list of all of them – charades, scavenger hunts, word searches, BINGO cards and more! Stay updated on all of our latest ideas for family fun by following along on Facebook, Twitter, Pinterest or our new RSS feed Bloglovin’. We look forward to seeing you there! That is cool. I’ll have to try it. Thanks for stopping by! I hope the boys have fun with it!